Improve Birdie’s Eating Habits “Bootcamp”! At The Center for Avian and Exotic Medicine, one of the most important things we do is educate clients about proper nutrition for their pet birds. Many people are not aware that “all seed” diets lack important vitamins and minerals and there are other options for feeding a balanced diet. 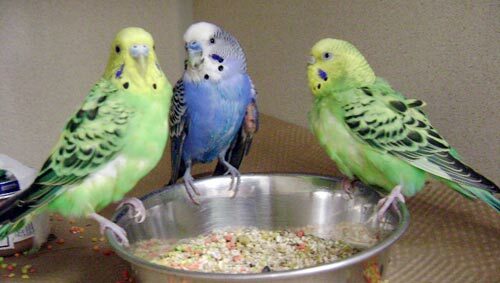 Unfortunately, clients often tell us that their birds don’t like pellets or “healthy” food. We recognize that birds can be fussy, and often will throw unfamiliar food aside making owners feel guilty for depriving their birds of the food they want. In addition, it can be scary for owners to see their bird not eat for a day or more, and nobody wants to worry that their beloved avian companion may starve itself during the conversion process. In order to help owners improve the health of their pet birds, we are now offering a “Birdie Conversion Camp” here at the Center. This program allows birds to board with us while our expert staff carefully converts them to a healthier diet. Once birds have fulfilled the boarding requirements, they are housed at our facility until they are converted to a diet consisting of formulated pellets, high quality fruits and vegetables, whole grains and exotic nuts, and other bird-safe foods. While here, they are weighed daily, their droppings are monitored for any important changes, and special attention is paid to evaluate their progress. We recognize that each bird is an individual. Some birds will convert quickly and easily, while others may have a more difficult time. We find that most birds will convert in under two weeks, but in some instances it can take longer. Because of this, the charges are based on a fixed rate for up to 3 weeks. Please see our Conversion Camp Guidelines below for specific rules and details. 1. One of the reasons we have so much success teaching birds to eat new foods here at the Center, is that they are in a new environment. When they are out of their daily routine, see other birds eating different foods, and have new people serving them their meals, birds are more likely to try new things. We believe that seeing owners during this time can trigger their desire to go back to old, unhealthy eating habits. For this reason, we ask that clients do not come to visit more than once a week during camp. 2. While birds are here, clients are welcome to call for telephone updates on their pet’s progress, but please no more than once daily. 3. While most birds are successfully converted here at the Center, there are always exceptions. The staff here will make every effort to be successful, but in the event that after 3 weeks of trying a bird will not safely change their diet, it is in their best interest to go home. Clients will still be responsible for the full set price of the camp. 4. All birds must be picked up within 24 hours of notification that their bird has been successfully converted. If clients are unable to pick their pet up in that time frame, they are welcome to board their birds here at our standard boarding rates. 5. Possible side effects of a diet change are: weight loss or fluctuations in weight, change in the color or consistency of droppings, and increased drinking. 6. All birds participating in the camp must fulfill our boarding requirements. 7. When birds are picked up, clients will receive a report card. On it will be the bird’s current weight and a list of the foods they have been enjoying at camp!